Ever since intrepid explorer Paul Sperry dreamt of inventing shoes that would stop him falling off his yacht (first world problems, Paul), boat shoes have been considered one of best examples of function-meets-form footwear on the market. More than 80 years on, whether you consider the casual style a menswear mainstay or think they’re better off overboard, it’s clear that boat shoes are a classic that won’t sink out of view for a long time to come. They speak of laid-back east coast style, but inspiration for these versatile moc-toed, leather shoes came from the most unlikely of places. Sperry did what any enterprising person would have after spotting this; he ran home and got to work, hacking up old pairs of shoes with a knife in a bid to mimic the grooves. The initial makeshift version of the shoe worked, but with one small hitch – the black soles of the prototype left nasty marks all over the deck of the boat. So Sperry decided to combat this by switching to a white sole and the rest, as they say, is history. Then, there’s the remaining construction of the shoe: lambskin lining, extra padding in the foot bed and a 360-degree lacing system where the laces clinch down the top of the foot as well as feeding around the heel. All of these extras raise the level of the shoe’s execution, look and wearability both on- and off-deck. Being made in this way means boat shoes often require a bit of TLC in order to stay in tip-top condition. So, how can you keep yours shipshape? Invest in a water-based cream shoe polish and apply it regularly to protect the leather. You can also use a water and vinegar solution, along with a pencil eraser to remove any small blemishes in a pinch. As boat shoes are likely to come into contact with water at some point (whether it’s the ocean or a spilled pint of lager), remember to always dry them at room temperature to keep the leather from drying out and developing cracks. Now that you’re suitably educated in boat shoe history and maintenance, let’s take a look at some of the best examples you can get your hands on and your feet in. While it’s true that Lacoste is a tennis apparel brand, set up by a tennis player to make, well, tennis stuff, there’s no arguing with the fact the brand makes some seriously good boat shoes. Lacoste’s versions of this casual classic makes use of both traditional materials like leather and suede along with canvas and mesh to create boat shoes that maintain their trademark uncluttered look, while at the same time adopting a contemporary edge. Available at Lacoste, priced £100. If you’re going to buy a pair of boat shoes, you might as well go with the brand that invented them. Sperry is to boat shoes what Apple is to smartphones and what Coca-Cola is to fizzy drinks. The US firm is essentially the boat shoe granddaddy and has a truly unbeatable heritage appeal. For classic, two-lug, leather and suede versions, this should be your first port of call. Available at End Clothing, priced £85. Michigan-based purveyor of nautical footwear Sebago may have been about 10 years later to the party than Sperry, but what it lacks in that decade’s worth of heritage, it more than makes up for in quality and craftsmanship. Sebago has been pedalling its trade since 1946 and is not only beloved by sailors, but also by preppy Ivy League students, who adopted the brand’s ‘Docksides’ in the 1980s as their signature footwear. Available at Sebago, priced £109.99. For reliability, value for money and quality, good ol’ Marks and Spencers is the best around. And it turns out the high street stalwart makes some pretty snazzy boat shoes too. As expected, the M&S take on the classic footwear style is durable, easy on the eye and affordable. Look out for classic soft leather options, featuring that original herringbone cut-out sole. Available at M&S, priced £59. When you think of preppy all-American style, Ralph Lauren is always one of the first brands that spring to mind. 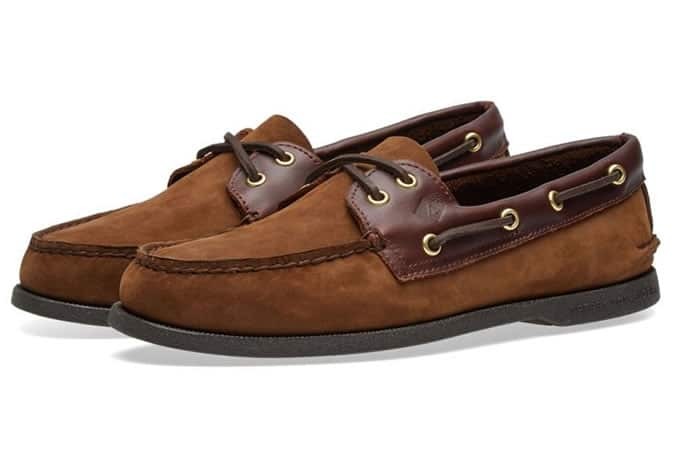 So, it goes without saying that the label has more than perfected its take on the boat shoe over the years. Ralph Lauren’s designs are simple, clean and classic, with an emphasis on quality. Check them out and buy with confidence. Available at John Lewis, priced £119. With variety, style and affordability at the fore, Topman is a bankable high street spot to pick up a pair of boat shoes. The thing that sets the retailer apart from the rest is the sheer depth of its selection. Leather, suede, nubuck and canvas styles – you can find them all here. Available at Topman, priced £55. Kurt Geiger is a name synonymous with high-quality footwear. Since the 1960s, the quintessentially British firm has been designing upscale shoes for the mass market, as well as putting its own unique stamp on classic, pre-existing silhouettes. That’s exactly what it has done with this definitive piece of preppy, American east-coast clobber, and it works beautifully. Available at Kurt Geiger, priced £39. As far as British footwear brands go, Clarks is undoubtedly the undisputed number one, certainly on the high street. This almost two-century-old business has turned its hand to pretty much every style imaginable over the years, not to mention inventing plenty of its own along the way. 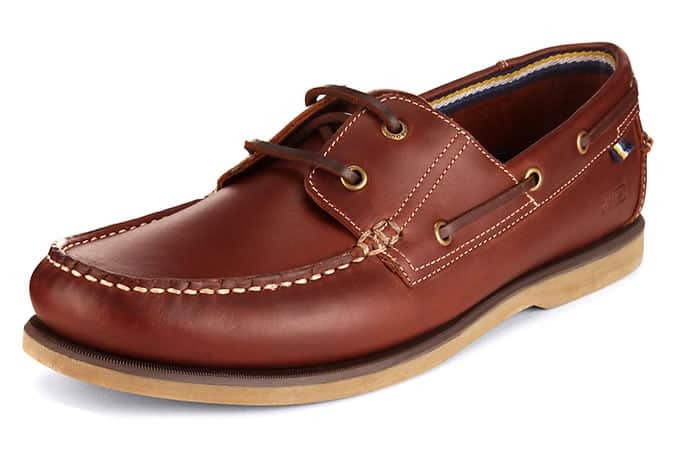 Clarks’s boat shoes are just what you’d expect from such a respected manufacturer – good looking, durable and so comfortable you can feel it just by looking at them. Available at Clarks, priced £75. Montague Burton borrowed £100 from a relative to set up a menswear shop back in 1903, and he certainly didn’t disappoint. Well over a century later, Burton has carved out a niche on the high street as the place to go for no-frills, fuss-free, fashion-made-easy apparel. The brand’s ethos is reflected in its selection of boat shoes, which merge style and value for money to seamless effect. Available at Burton, priced £30. What really sets Maine-based boat shoe maker Quoddy apart from the rest is its approach to manufacturing. The brand’s expertly handcrafted shoes are laboured over by skilled tradespeople at wooden workbenches, using the same tools and techniques for hundreds of years. These skills have been passed down through generations, resulting in second-to-none quality footwear identifiable by a signature two-tone design. Available at Mr Porter, priced £155. Canadian shoe giant Aldo is one of the world’s leading forces in footwear fashion. Founder Aldo Bensadoun was the son of a shoe merchant and the grandson of a cobbler, making him well placed to take on the boat shoe. In 1973, Bensadoun decided to follow in the family footsteps and set up the shop we all know and love today. More than 40 years on, it still turns out some of the best around. Available at Aldo, priced £50. Tommy Hilfiger is another one of the world’s leading names in American preppy style. Since 1985, the designer lifestyle label has been fusing a classic east coast design aesthetic with a healthy dash of west coast cool. Cop a pair of Tommy boat shoes, and you can rest safe in the knowledge that you’ve bought from one of the best. Available at Amazon, priced £73. In-house brand products at Office always manage to strike a balance between quality and affordability. The London-based retailer, which took its name from the fact that it used to display products on old office furniture, has been kitting out style-conscious guys since the 1980s. Over the years it has built a reputation as a go-to place to grab a pair of top-notch boat shoes, and it’s easy to see how. Available at Office, priced £34.99. While it’s best known for making sturdy outdoor footwear co-signed by rap royalty, Timberland has its roots firmly planted in America’s boating country. As such, the company knows a thing or two about making boat shoes. In fact, next to its 6” work boots, this is probably the silhouette that the Massachusetts-based label is most renowned for. Available at ASOS, priced £135. When Rockport started out back in 1971, its father and son founders had a clear vision: to make smart shoes that were comfortable enough to be worn every day. The business’ boat shoes are created with comfort and wearability at the forefront of the design process; it’s just an added bonus that they look good, too. Available at John Lewis, priced £85.